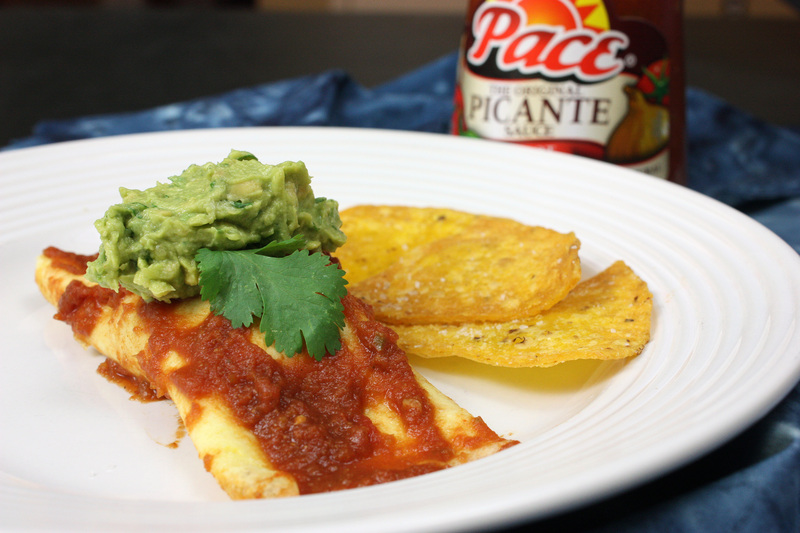 What do you do when Foodbuzz gives you Pace Picante sauce? Make enchiladas, of course! As a Featured Publisher and a member of the Tastemaker program at Foodbuzz, I periodically get opportunities to receive free samples of delicious food from various vendors. Previously, I received a huge box of avocados (one of my most favorite fruits ever) and made ice cream with some of my bounty. Most of the time, I don’t participate – there aren’t a lot of products out there that I can eat. But when Foodbuzz announced they were giving away free Pace Picante sauce to members of the Tastemaker program, I was on board. While I love to make homemade salsa, I am already extremely low on our supply from the summer (only 1 jar left! ), and wouldn’t dare use it for enchilada sauce. And while I could make enchilada sauce from scratch (as I’ve done here and here), it was a weeknight when I made these, and the Pace Picante sauce streamlined the process considerably. While the photo may not represent just how tasty these were (enchiladas are not exactly the most photogenic of all foods), let me assure you – they were quite delicious. 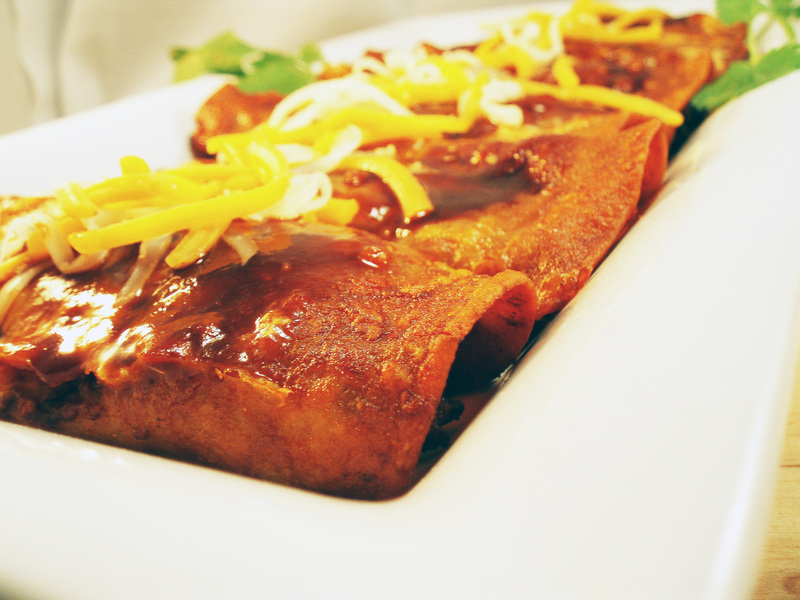 Let me let you in on another little secret – these enchiladas were completely grain-free as well! That’s right – no tortillas. See, I can tolerate corn from time to time, but generally, I try to avoid it. (Yes, those are corn tortilla chips you see gracing the plate. That’s mostly decoration for me, although I might have snuck a bite.) What do I use instead? Egg crepes! Carol over at Simply…Gluten-Free has a recipe. Honestly though, you barely need the recipe – these are so easy. I made up a bunch, and gently rolled them around a filling, and place them in the baking dish, just like you would any other enchiladas. This time, my filling was a mixture of leftover cooked chicken, a bit of enchilada sauce, and sauteed spinach – but you can use anything. I’ve previously filled them with cooked chicken and a bit of leftover butternut squash puree. (That was so delicious, by the way!) It might sound odd, but these are just as satisfying as any tortilla-based enchilada. Just roll them up, place in a baking dish, spoon some sauce over, and bake for about 10-15 minutes at 350 degrees. Dinner is served! Blend all ingredients together. Spoon over enchiladas as desired. A big thanks to Foodbuzz for the opportunity! First, a disclaimer. These are not “chef-y” enchiladas. They are not likely something you will ever find at a fancy-schmancy restaurant. They are also not anywhere near authentic Mexican food. That being said, they are a household favorite. In their history, there have been a lot of variations, but this most recent version has been one of the best. Feel free to substitute the meat for chopped up chicken or turkey. 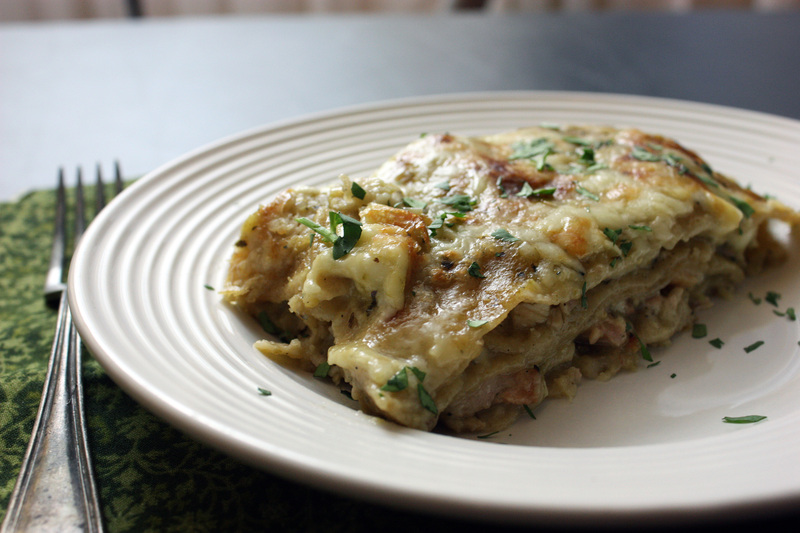 (great way to use up leftover turkey from Thanksgiving!) Feel free to adjust the chili powder, chipotle chili powder, or other seasonings as you desire. The way I have written this recipe makes for a pretty spicy sauce, so beware. 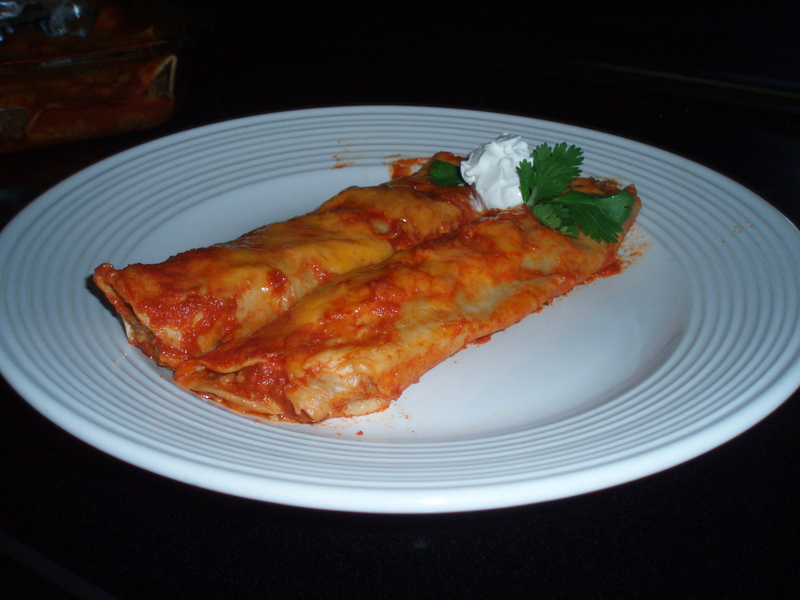 But ultimately, be prepared for a cheesy, melty, comfort-food style enchilada dish. It may not be the most eloquent dish you will ever prepare, but I hope it will become a favorite at your house as well! Coat a large skillet with oil, heat to medium and sauté onions until translucent, about 3-4 minutes, add garlic, sauté a minute longer. Put onion, garlic, and tomatoes into blender (I use a hand blender, makes it easier) and puree. Pour back into skillet and simmer. Add chipotle powder and chili powder, tasting until you like the flavor. For me, it was 2 T of the chipotle powder and 2 T of chili powder, but I like it pretty spicy. Use less chipotle powder for a milder sauce. Dilute sauce as it simmers with water. Add salt to taste. Simmer about 30 minutes. As sauce is cooking, heat another pan and brown ground beef. Season with chili powder, garlic powder, cumin, salt and pepper. 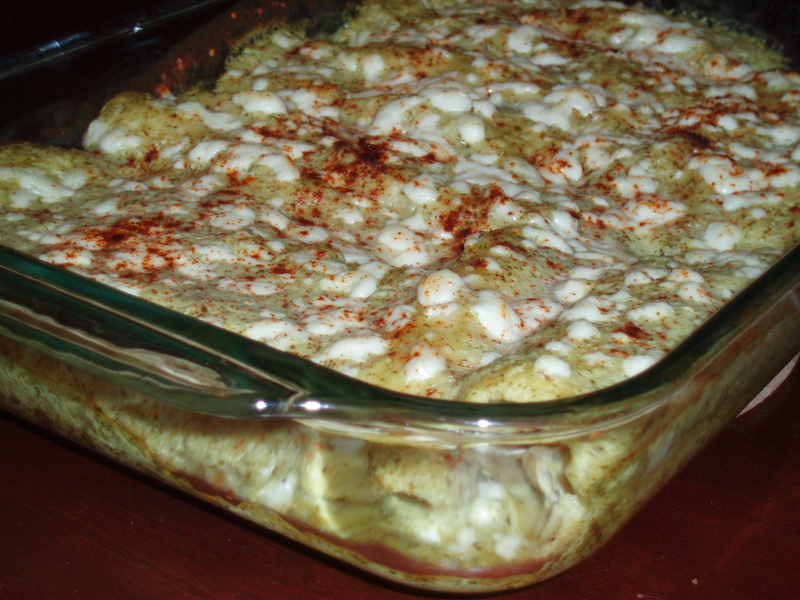 Once meat is browned, add a little sauce (about ½ cup), about ¾ c grated cheese, and 4 oz cream cheese. Mix until melted. Assemble the enchiladas by laying the tortilla flat in one hand, and using a spatula or spoon, placing a thick strip of filling down the middle. Roll the enchilada and place it in a 13X9 inch baking dish, seam side down. Repeat with remaining tortillas. Pour sauce over enchiladas, and top with shredded cheese. Bake 10-15 minutes or until bubbly. Top with sour cream and/or cilantro, if desired. Tonight I decided chicken enchiladas with the salsa verde was a yummy idea. Thank you, Elise of Simply Recipes http://www.elise.com/recipes/ (I love the blog, by the way!!!) for inspiring that great idea! Your recipe and pictures made me salivate! Good thing I had lots of leftover salsa! These can be made with bottled salsa verde if you don’t want to make your own. Simmer chicken in the chicken broth, garlic cloves, onion, cumin, coriander, and beer for 15-20 minutes or until just cooked through. (Add water if the broth does not cover the chicken.) Shred chicken once it has cooled. Discard the liquids and vegetables. Meanwhile, heat a few drops of oil in frying pan over medium heat, and warm each tortilla by placing in the pan for a few seconds, turn, add another tortilla on top, and flip. Place these tortillas on a paper towel to drain excess oil, and repeat with remaining tortillas. Place the salsa verde in a saucepan and turn the heat on low to warm. Mix the shredded chicken with ½ cup or so of the salsa verde and the cream cheese over low heat until cream cheese melts. Salt if necessary. Dip each tortilla in salsa verde and place a little chicken mix in each tortilla, roll, and place seam side down in a 13X9 inch baking dish. Stir the remaining salsa verde with the sour cream until the sour cream melts, and pour over enchiladas. Top with crumbled cheese and chili powder. Bake in oven at 425 degrees for 15 minutes or until the enchiladas are bubbly. Garnish with cilantro and lime wedges.